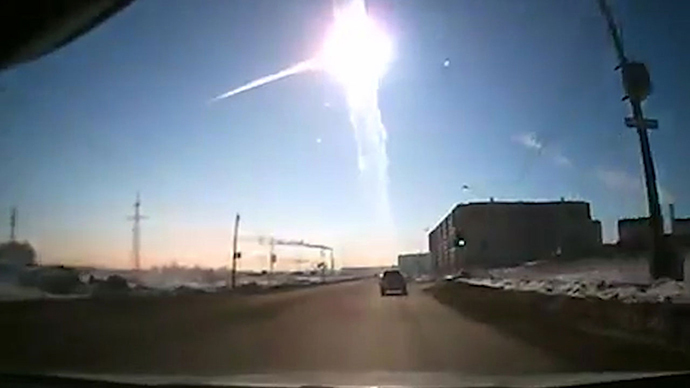 CHELYABINSK, Russia (Reuters) – A meteorite streaked across the sky and exploded over central Russia on Friday, raining fireballs over a vast area and causing a shock wave that smashed windows, damaged buildings and injured 1,200 people. 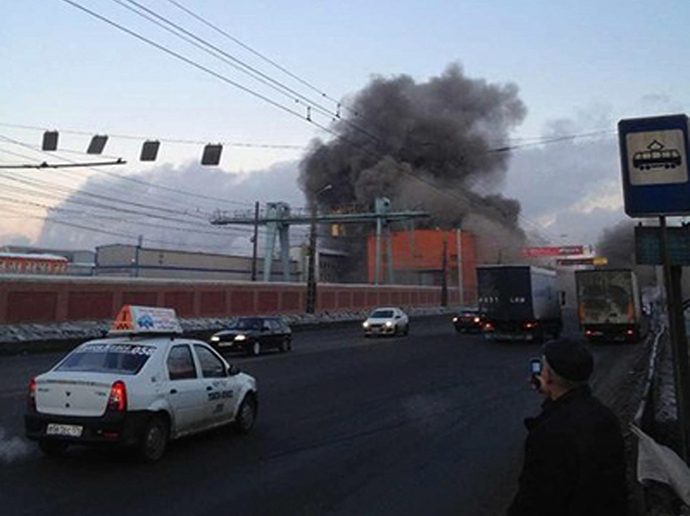 People heading to work in Chelyabinsk heard what sounded like an explosion, saw a bright light and then felt the shock wave, according to a Reuters correspondent in the industrial city 1,500 km (950 miles) east of Moscow. The fireball, travelling at a speed of 30 km (19 miles) per second according to Russian space agency Roscosmos, had blazed across the horizon, leaving a long white trail that could be seen as far as 200 km (125 miles) away. Car alarms went off, thousands of windows shattered and mobile phone networks were disrupted. The Interior Ministry said the meteorite explosion, a very rare spectacle, also unleashed a sonic boom. “I was driving to work, it was quite dark, but it suddenly became as bright as if it were day,” said Viktor Prokofiev, 36, a resident of Yekaterinburg in the Urals Mountains. The meteorite, which weighed about 10 tonnes and may have been made of iron, entered Earth’s atmosphere and broke apart 30-50 km (19-31 miles) above ground, according to Russia’s Academy of Sciences. The energy released when it entered the Earth’s atmosphere was equivalent to a few kilotonnes, the academy said, the power of a small atomic weapon exploding. No deaths were reported but the Emergencies Ministry said 20,000 rescue and clean-up workers were sent to the region after President Vladimir Putin told Emergencies Minister Vladimir Puchkov to ease the disruption and help the victims. The early-morning blast and ensuing shock wave blew out windows on Chelyabinsk’s central Lenin Street, buckled some shop fronts, rattled apartment buildings in the city centre and blew out windows. One piece of meteorite broke through the ice the Cherbakul Lake near Chelyabinsk, leaving a hole several metres (yards) wide. The region has long been a hub for the Russian military and defence industry, and it is often the site where artillery shells are decommissioned. A local Emergencies Ministry official said meteorite storms were extremely rare and Friday’s incident may have been connected with an asteroid the size of an Olympic swimming pool that was due to pass Earth. But an astronomer at Russia’s Academy of Sciences, Sergei Barabanov, cast doubt on that report and the European Space Agency said its experts had confirmed there was no link. Despite warnings not to approach any unidentified objects, some enterprising locals were hoping to cash in. “Selling meteorite that fell on Chelyabinsk!” one prospective seller, Vladimir, said on a popular Russian auction website. He attached a picture of a black piece of stone that on Friday afternoon was priced at 1,488 roubles ($49.46). The Emergencies Ministry described Friday’s events as a “meteorite shower in the form of fireballs” and said background radiation levels were normal. It urged residents not to panic. The first footage was shot by car dashboard video cameras and soon went viral. Russians also quickly made fun at the event on the Internet. A photo montage showed Putin riding the meteorite and Nationalist politician Vladimir Zhirinovksy said in jest it was really a new weapon being tested by the United States. Experts drew comparisons with an incident in 1908, when a meteorite is thought to have devastated an area of more than 2,000 sq km (1,250 miles) in Siberia, breaking windows as far as 200 km (125 miles) from the point of impact. The meteorite struck just as an asteroid known as 2012 DA14, about 46 m in diameter, was due to pass closer to Earth – at a distance of 27,520 km (17,100 miles) – than any other known object of its size since scientists began routinely monitoring asteroids about 15 years ago.